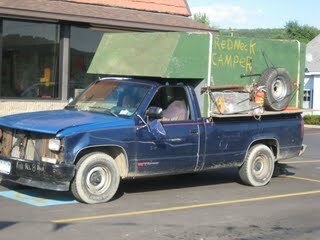 Here is one of my neighbor's RV at the local grocery store in Whitney Point NY. This is indeed a Redneck Camper. Notice he is in a handicapped parking spot. He even hit the sign behind the truck. I can't make this stuff up!